Working with renowned interior designer, Sagrada, the new bar will be transformed to reflect the quintessential elegance of a Parisian bar, with striking aged brass, bronze glass, and concealed lighting designed to illuminate the bottles on display, housing an extensive selection of whisky from around the world. Bespoke furniture, selected specifically for this refurbishment, will be a combination of upcycled and vintage pieces, placed alongside free-standing lighting structures. The cocktail list is inspired by 1920s Paris with creations such as the Parisienne, made with Hendricks gin infused with dry herbs, St Germain elderflower liqueur, white grapes, lemon juice, egg white, topped with soda and finished with a dash of Absinthe, or La Belle Epoque, featuring Cointreau mixed with Aperol, grapefruit juice, homemade star anise syrup and topped with Champagne. These sit alongside French classics such as the Sidecar; French Blonde; French 75 and French Martini. In addition, Head Chef Damien Rigollet will serve an array of delicious bar snacks or ‘Collations’, including French artisanal charcuterie board with cornichons and fresh bread; Langoustines; Escargots with garlic and parsley butter or Mini Croques Monsieur. This summer will also see the launch of “CityPM” a live jazz series in the stunning garden at Coq d’Argent, overlooking the City. In collaboration with Moet & Chandon, performances will take place on Tuesdays and Wednesdays (6-10pm) and Saturdays (7-11pm) from 3 June until end of August. Coq d’Argent is a D&D London restaurant that serves classic French food in a spectacular rooftop setting in the City of London. 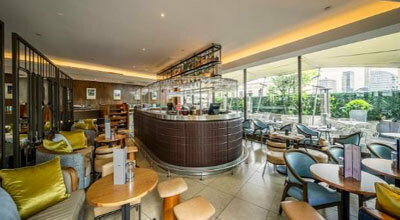 In addition to the main restaurant, the grill offers a less formal menu at lunchtime, while the outdoor terraces and gardens provide a verdant oasis in the heart of the Square Mile.